Hunting is an extremely popular sport worldwide. Like any sport, it’s necessary to consider safety, gear and other equipment to have a successful hunt. So what’s the most important gear to take with you on the hunt? Many people would be inclined to state the obvious, tents, food, ammunition and a good gun etc. While these are very important items, proper clothing can make a significant difference in the enjoyment, safety and success of your hunt, whether you’re tracking wild turkeys or big game. Consider the weather, for example. If you fail to take the clothing appropriate to the climate and terrain in which you’re hunting, you might end up cold, wet and absolutely miserable. Imagine how you’re going to feel if there’s a beautiful buck within shooting range but you can barely aim or shoot straight because of your violent shivering. Additionally, when you are uncomfortable you might have a tendency to fidget, thus alerting potential game to your presence. Choose clothing that keeps you dry and warm, yet lets your skin breathe and helps control scent. The proper hunting attire also protects you from potential harm. 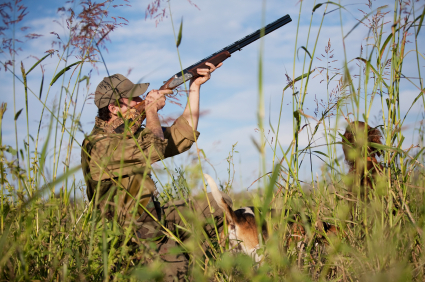 Make sure you understand the safety requirements for the area in which you’ll be hunting. Neglecting to wear the required safety clothing will put you at unnecessary risk and may ruin your hunt. While most hunters wear camo and the required fluorescent orange vest, some types of hunting require further consideration with regard to color. When hunting turkeys for example, it’s important not to wear red, white, blue or black clothing, thus reducing the potential for being mistaken for a gobbler. For a safe and successful hunt, packing the proper clothing should be considered one of the most important preparations. Similarly, your binoculars will work much better when they are “outfitted” with accessories that enhance your viewing experience. EyeShields are an optics accessory that attach to your binoculars to keep out glare, dust and other distractions. Just as comfortable clothing can make you a more efficient hunter, EyeShields increase clarity and reduce distractions, creating a more comfortable optical experience so hunters can focus on the most important part of the hunt--finding game!